Swim with whale sharks and sailfish, help endangered sea turtle hatchlings, explore the coral reef or underwater sculpture museum, and walk in the footsteps of a goddess - all on Isla Mujeres, an island dedicating itself to responsible tourism. One of the best places on the planet to swim with whale sharks? Isla Mujeres, Mexico, Image: John Vater, Ceviche Tours, Isla Mujeres. 2. The Coral Reef: Part of the Mesoamerican Barrier Reef, second largest in the world. 3. Sea Turtles! Local fisherman inspired (demanded) protection for them and their eggs. 4. Responsible Attitude: The community is evolving from a fishing / hunting (including whale sharks) dependent economy to marine conservation and eco-tourism. Isla Mujeres is only a 15-minute ferry ride cross the bay from Cancun – but it is a world apart. This tiny (5 x ½ mile / 8k x .8k), relaxed, and beautiful island in the Caribbean Sea is part of the Mesoamerican Reef, the second largest barrier reef system in the world. For centuries the inhabitants made their living fishing – and hunting whale shark. As the demands of human life grew, so did the demands of the fisherman, putting more and more pressure on the marine eco-system. Today, a responsible eco-tourism industry which includes: deep-sea fishing (mostly catch and release), whale shark swimming, bird and turtle watching, as well as simply enjoying the beaches and other adult and family oriented activities, is thriving. In 2007, the island's sustainable direction got a boost from New York fashion photographer and long-time Isle Mujeres lover, John Vater, who co-founded Ceviche Tours with his friend of almost thirty years, islander Louis Refugio "Cuco" Sanchez. 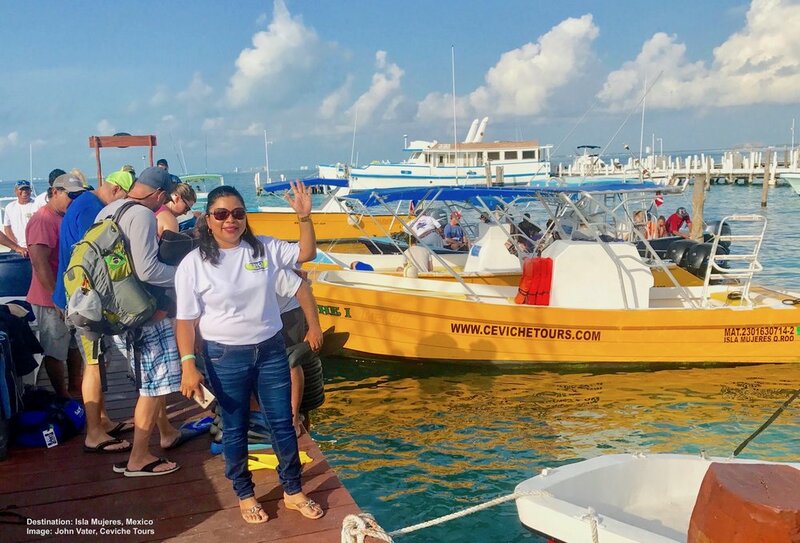 Together John, Cuco and Ceviche Tours are committed to sustainable marine tourism as a way to help the environment and the local people. In an interview with Smithsonian magazine, John said it best, "Instead of selling a fish, if you bring people to snorkel with that fish, you can make a sustainable living off of the life of the animal". Indeed - and have some fun too! Isla Mujeres’ known history began over 1,500 years ago when Ixchel, the Mayan goddess of the moon, fertility, medicine - and happiness - made it her home. Legend has it that light shining from her temple helped sailors navigate the seas. When the explorer Francisco Fernandez de Cordoba "discovered" the island in 1517, its only inhabitants were Ixchel's priestess and her female retinue inspiring him to dub it: Isla Mujeres, which means, "Island of Women". Ixchel's influence can still be felt in the island's relaxed and happy atmosphere. Take a boat tour or snorkel and swim with the giant whale sharks who glide through the water scooping up the spawn of thousands of colorful fish. And do not miss the annual Whale Shark Festival! Bring along the kids and their grandparents, too - it is fun for the whole family. Swimming with sailfish. Why not, asks John Vater of Ceviche Tours. Experience it for yourself! Image: Thanks to John Vater & Ceviche Tours, Isla Mujeres, Mexico. Sharks: Whale and nurse sharks. Rays: Spotted eagle, sting and manta rays. Dolphin, sailfish and barracuda. Coral Reef Fish: Angel, trumpet, and many starfish species. Sea Turtles: green, hawksbill, leatherback, and loggerhead sea turtles. Swim with whale sharks: Several operators offer the opportunity to swim with these gentle giants of the sea. Check to ensure your operator follows responsible practices. Swim with Sail Fish: An unusual and amazing marine experience, swim with one of the fastest fish in the sea. Civeche Tours offers this, whale shark swimming (one of the slowest fish! ), and deep sea (catch and release) fishing. Most tour operators suggest you be an intermediate to strong swimmer for this wildlife encounter. 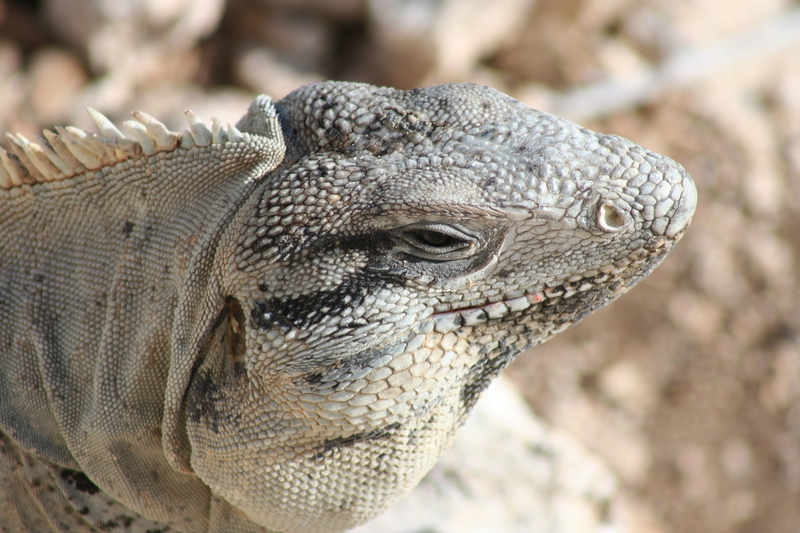 Mexican spiny tailed iguana, trejone (a type of badger). La Tortugranja (Turtle farm): In the 1980's, local fisherman decided to save sea turtles from poachers. Le Tortugranja, now run by the local government, was established as a rescue and release facility as well as home for a number of turtles that for health and safety reasons can not be released. During the season the staff and volunteers cache and protect turtle eggs until they hatch and are immediately released. 152 species of resident and migratory birds (especially on Isla Contoy), including: frigate bird, double crested cormorant, brown pelican, booby bird, American flamingo, egrets, sea swallow, and roseate spoonbill. Isla Contoy National Park: Isla Contoy is another, even tinier, island 19 miles (30 km) north of Isla Mujeres. Be one of only 200 visitors allowed each day on this pristine nature reserve. It is considered the most important migratory bird-nesting place in the Mexican Caribbean. Spotted rays also enjoy congregating here. Enjoy bird watching, snorkel with the manta and spotted rays, explore the trails, and have a special island lunch. Bring mosquito repellant for the trails. 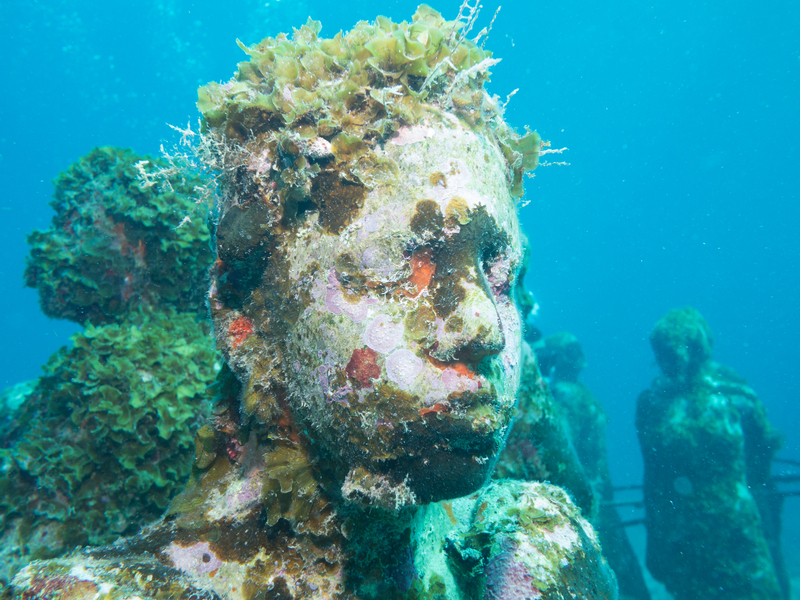 Since 2009, the Underwater Museum of Art has been fascinating divers. Hacienda Granja: A retired pirate’s house built to woo a (37-years younger) local beauty. Don’t miss the solar clock. Mayan Culture: Take some time to explore and understand the ancient Mayan civilization. Visit El Meco(on the northern peninsula), tour Coba, the site of the Nohoch Maal pyramid, Tre Rea Mayan village from their classical period, and Chichen Itza, the ancient Mayan capitol and a UNESCO Heritage site. Mujeres and Cancun. Not to be missed. Always choose responsible wildlife experience providers. 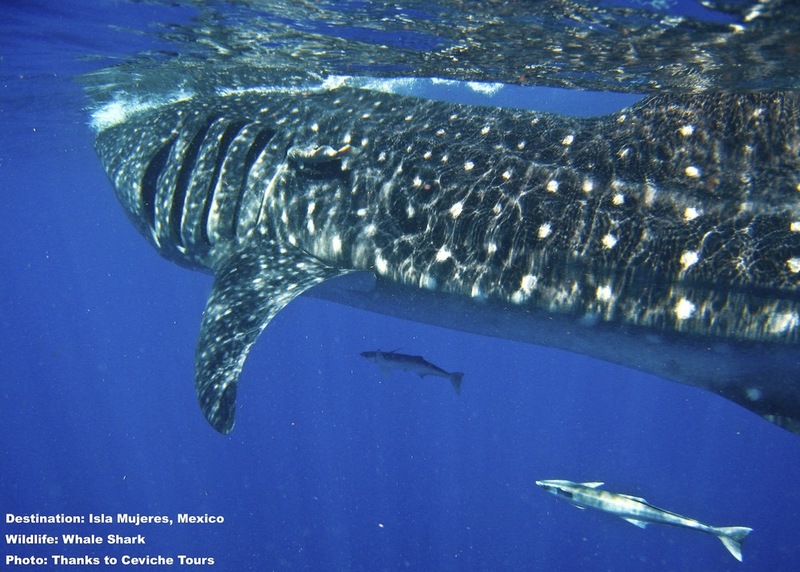 Whale Shark Image: Thanks to John Vater, and Ceviche Tours. For marine life experience best practices, including tips on snorkeling (never diving) with the big fish, see “Escape from Winter! Swim With Whale Sharks” or click here. If you dive the reefs, keep well away from the corals, which are easily damaged. Reef systems throughout the world are coming under increasing stress due to pollution, overfishing, and climate change. DO NOT feed the wildlife, including the ubiquitous iguanas! Not all wildlife / marine experience providers on Isla Mujeres are responsible. At Destination: Wildlife we encourage people to visit places that endeavor to provide wildlife experiences in the most responsible way. That is: in line with today's best knowledge. We encourage enjoyment of those responsible wildlife experiences and quiet avoidance of the others. In this way: 1) the community still benefits from local responsible tourism initiatives and 2) venues and businesses with less responsible offerings will be economically encouraged to change. To be frank, one of our contributors was strenuously opposed to Isla Mujeres being included on our recommendation list. Why? One venue on this small, conservation conscious island advertises swimming with dolphins that "love people" and "want to be hugged and kissed" by humans. Progress and research sometimes alters what we believed, at one time, to be true. Today's research has shown that neither of the venue's advertised assurances are reality. Please do not use your time and money to reward a business that offers an experience detrimental to dolphins, or any other wildlife. Do NOT touch or swim with captive dolphins. If, in the future, this organization restructures into a responsible experience provider, we will be the first to visit and recommend it. Thank you for caring. Enjoy their wonderful nature, diverse marine life and vibrant community. Celebrate in their annual whale shark festival every July. Participate in the baby turtle release program. And when you view, snorkel, or swim with the whale sharks, sailfish, or any other marine life, make sure that you - and the experience providers you choose - follow today's best responsible wildlife tourism practices. The best time to visit Isla Mujeres depends on what you want to experience. You will need to plan ahead during this period. The holiday season as well as “spring break” (the week before and the week after Easter Sunday) are always the busiest time of year and accommodations fill up months in advance. Also, be mindful of Carnival, as many long-time visitors return to celebrate for the five days leading to Ash Wednesday. Prices are lower and the island much quieter during the off peak months. The Isla Mujeres Tourism Bureau recommends September through November as the most economically conservative time to visit. This is the season for swimming with whale sharks and watching the sea turtle releases. A school of sailfish feeds on a "bait ball" of small fish in the waters off Isla mujeres, Did you know that you can swim with sail fish too? Image: John Vater of Ceviche Tours, Isla Mujeres, Mexico. Best time for whale sharks: Although some tour operators stretch the season, the most reliable times to swim with shale sharks are from June 1st to early September. Isla Mujeres' Whale Shark Festival is a week-long celebration of the world's largest fish. Best time for sail fish: From the end of December to the end of April are generally the best times. Sea turtle release: The sea turtle releases are generally late August through early October. Choose from all-inclusive five-star resorts to youth hostels and everything in between. The island also offers a selection of rental homes and beachfront studios. The Isla Mujeres Tourism Board maintains a list of accommodations on the island. If you choose to stay at a small inn or bed & breakfast stay, check on payment options; some of the smaller inns do not accept credit cards or charge extra for their use. A notice on the tourism board's website also offers the following warning: "We strongly suggest you book your accommodations directly through the hotel's website or use one of Isla’s rental agents that are on the island....There have been many times when vacationers reserve accommodations through an online mega-booking travel site, only to arrive on the island and the hotel or rental has never heard of them. The last thing you want to do is spend your first hours on Isla trying to find some place to sleep." Spanish and English in the main cities plus many local and regional dialects. US Citizens may obtain a tourist card / entry permit at the boarder. All travelers should check the regulations pertaining to their particular citizenship prior to making final plans. Malaria: Certain areas of Mexico are known malaria zones. Check with your doctor for the best course of action for you. Zika: Mexico is a known zika virus zone. Check with your doctor for the best course of action for you, especially if you are pregnant or thinking of becoming pregnant. We'd love to hear about Isla Mujeres adventures and so would other travelers. Send us your stories and photos.